Me just another guy one among the millions of people walking around. Music, reading, sports, travel & photography are some of my passions. trying my hands on blogging now. Welcome 2 my blog! What a impeccable match Rafa played yesterday. Was it Roger after all playing against him? The No 1 in the world?? I doubted...but had to believe when roger himself said "Yeah it was me" in the post match interview. Boy! was he outplayed, blasted off the court by this Spanish torpedo. 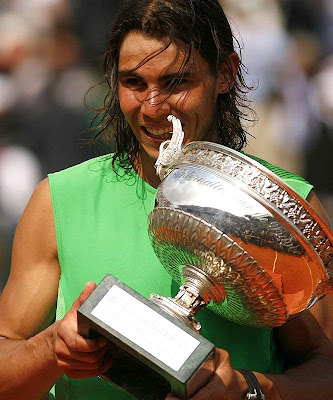 At 22 yrs, Rafa has already become a legend on his own rights by making Paris and Roland Garros his backyard. Four in a row...what a feat..Hail Rafa !!! And you thought a blog on tennis without a mention of ANA ? Can't be :-) ANA is now the numero uno woman tennis player and of course the French Champion.